New Jersey Senator Cory Booker speaks at a get out the vote event hosted by the New Hampshire Young Democrats in Durham, N.H., in October. New Jersey Senator Cory Booker, widely viewed as a possible Democratic presidential contender in 2020, is heading to the key primary state of New Hampshire this weekend for a confab with local Dems. 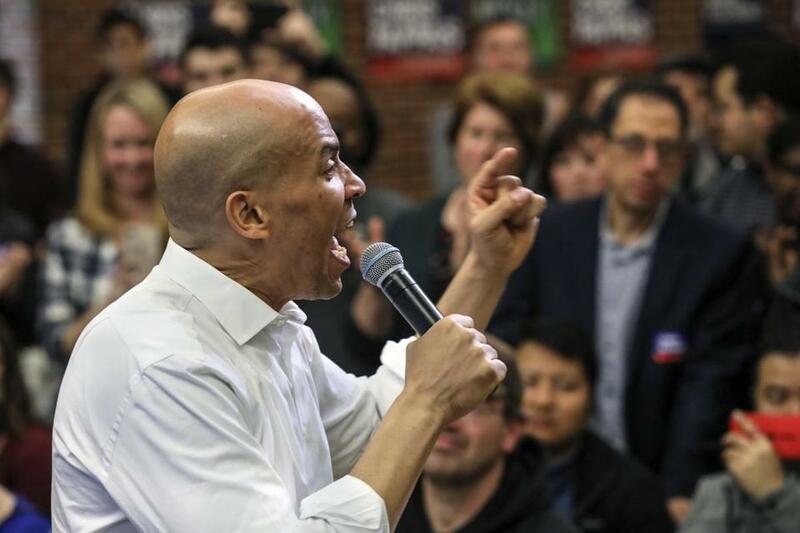 Booker, 49, will headline “a post-election victory celebration” for the New Hampshire Democratic Party on Saturday in Manchester, the state party confirmed in a release. A number of Granite State lawmakers and officials will join the charismatic Jersey senator, including Senators Jeanne Shaheen and Maggie Hassan, Congresswoman Annie Kuster, Congressman-elect Chris Pappas, state Senate President Donna Soucy, state Speaker of the House Steve Shurtleff, and Executive Councilor Andru Volinsky, the release said. “At the event, activists and party leaders will come together to celebrate the Coordinated Campaign’s hard work that kept both congressional seats blue and won Democratic majorities in the Executive Council, State Senate, and State House,” the party said. Booker, of course, may have sights set higher. He’s gained a national profile as one of the leading Beltway critics of the Trump administration, grabbing headlines in January when he delivered a passionate rebuke of the president’s reportedly disparaging comments about Haiti and African nations during an Oval Office meeting. Booker, questioning Homeland Security Department Secretary Kirstjen Nielsen during an oversight hearing, said he was moved to “tears of rage” when he learned about the comments. “The commander in chief, in an Oval Office meeting, referring to people from African countries and Haitians with the most vile and vulgar language — that language festers,” Booker said. He sits on two Senate committees tailor-made for boosting a national profile: the Committee on Foreign Relations and the Committee on the Judiciary, the latter of which gives him an opportunity to grill Trump’s appointments to the federal bench with the cameras rolling. Booker will likely have plenty of primary opponents, should he choose to jump into the White House race. Likely or rumored candidates include several prominent Massachusetts names, including Senator Elizabeth Warren, Congressmen Seth Moulton and Joe Kennedy III, and former Secretary of State John Kerry. Jaclyn Reis of the Globe Staff contributed to this report. Travis Andersen can be reached at travis.andersen@globe.com. Follow him on Twitter @TAGlobe.